We are Athletes, Bodybuilders, Crossfitters & Powerlifters. Guys who've lifted a few million lbs & downed a few thousand scoops of protein. We're also supplement pros who've done this before. Guys who know the difference between the good stuff & the over-hyped wannabes.For those who are serious about getting the best out of lifting are obsessed with 1 thing. Protein. And a quick comparison of top-selling brands shows R1 PROTEIN delivers more of what we all take protein for...protein! With state-of-the-art production facility in Aurora, Illinois. 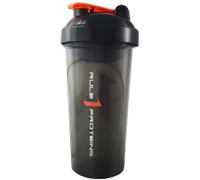 Rule 1 is one of the few sports nutrition companies to manufacture in every product category. From the very beginning, Rule 1 has always taken a hands-on approach to maintaining the very highest standards of quality.